If you are like me and you love that marbled fatty goodness of Japanese beef (the kind that melts in your mouth) you will want to know about Matsusaka beef. It is, in fact, a grade higher than Kobe. Beef in Japan is graded on its marbled fat content, so to have a higher grade, it must have more fat, evenly dispersed through the meat so that you never get a fatty texture in your mouth…only the pleasure of beef so juicy and tender that it literally dissolves on the palate. But first, let’s clarify some terms about Japanese beef. “Wagyu” actually simply means Japan (“wa”) beef (“gyu”), so it could be used to describe any type beef and is not an indication of grade. And while Kobe is the most well known Wagyu, there are higher grades of Wagyu. Higher grades of course, are determined by the degree of fat layers (“sashi”) in the meat. 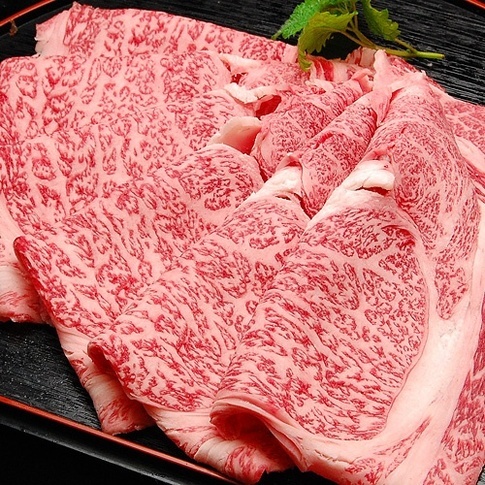 The marbling grades are 1 – 12, and whereas Kobe is 6+, Matsusaka is 10-12. To give you a basis for comparison, USDA Prime Beef is 6-8% fat, whereas top Japanese beef can be 25% fat. And much like the best sushi grade fish, not a lot of super premium grade Wagyu leaves Japan, so you may not have had a chance to taste it if you have not visited Japan. Matsusaka is widely acknowledged as the finest beef Japan has to offer. It is produced from the Tajima-ushi cows, female only, from the Hyogo Prefecture. There are raised in a quiet and serene area between 2 rivers. When they have no appetite, they are fed beer to stimulate hunger and then are fed a combination of tofu lees and ground wheat. These are the famous cows that receive massages and are played often soothing music to calm the heifers’ mood as it is believed that this leads to better quality beef. Create an unforgettable taste memory! This will likely be the most tender and juicy piece of beef you will ever have the opportunity to eat, so it’s definitely worth tracking down when abroad or definitely when in Japan.